Most big video games these days seem designed to work best with a controller. PC mouse and keyboard controls are often an afterthought. Prey is the unusual, welcome exception. Since Prey is also on consoles, I assumed it’d work fine with a controller. I figured it’d have a four-way hotbar tied to the D-Pad, combat that feels arguably smoother with sticks and triggers, that kind of thing. How wrong I was. 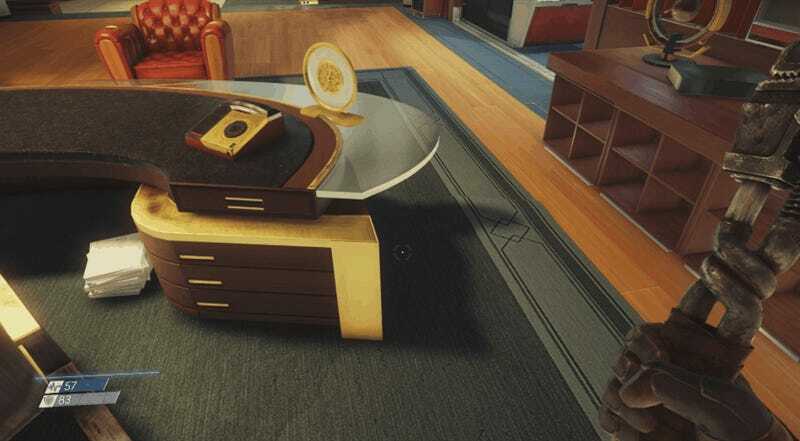 As it turns out, Prey wears its late-90s Looking Glass influence on its sleeves even more proudly than its cousins BioShock and Dishonored. This game is System Shocky as hell, and because of that, feels like it was made for the PC. In general, the PC version of Prey is polished and runs well. That’s a relief, given how many recent games have launched in poor shape on PC. Prey runs beautifully on my (pretty beefy) PC, and from what I’ve seen around the Internet, it sounds like it’s running well all the way down the line to mid-level GPUs. It supports 21:9 monitors and, while it’s missing an in-game FOV slider, Arkane says they’re working on adding one and in the meantime you can tweak the FOV in a config file. Prey isn’t a graphically intensive game, and occasionally it even looks dated. I don’t really care about that, though others might. I’m just happy it runs as well as it does, and am much more interested in how it plays than in how it looks. After about 20 minutes of playing with a controller, I decided to try out using a mouse and keyboard. I switched over and have yet to even consider switching back. 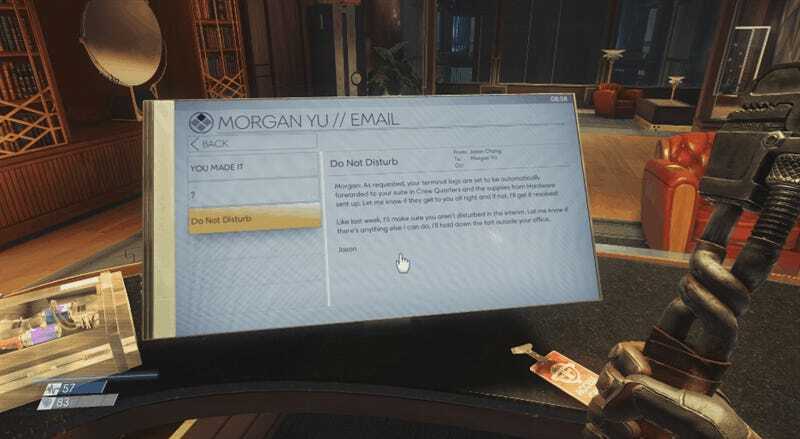 Arkane has pulled off a lot of smart, slick interface tricks with Prey, and I wanted to take a moment to highlight a few. First there’s the basic stuff. Menus are designed to work seamlessly with a mouse. 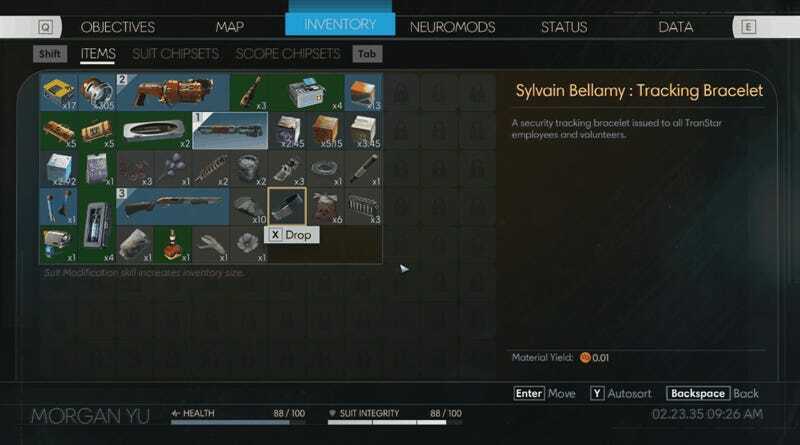 You can drag and drop items around in your inventory, easily navigate the map, etc. The “lean” controls are mapped to Q and E like they should be, and it’s really easy to change your keybindings in the options menu. You can assign up to ten weapons to the 1-0 keys, just as God intended. If you turn the mouse wheel, it takes you out to a Deus Ex-like radial menu, which is where you access your full inventory as well as pop health or psi packs like in BioShock. This is one place where Prey feels more like a console game, what with the thumbstick-friendly radial menu. It would be nice to have an option to flick the mouse wheel through items like in older PC games, but the current system still feels as smooth/smoother than it would with a controller. A couple of cool things are happening there. First, the “search” dropdown pops up when you move your cursor over the drawers, but it does so without locking you into a sub-menu. Prey doesn’t pause when you’re rifling around, which is good, because an enemy could sneak up on you at any time. It’s also nice because it makes rifling around—something we’re almost certainly going to be doing a lot of in this game—almost frictionless. You can cycle through individual items in the drawer using the mouse wheel, and easily pick up one while leaving another behind. You can also directly control the cursor with the arrow keys. When you’re done, you just walk away. No muss, no fuss. 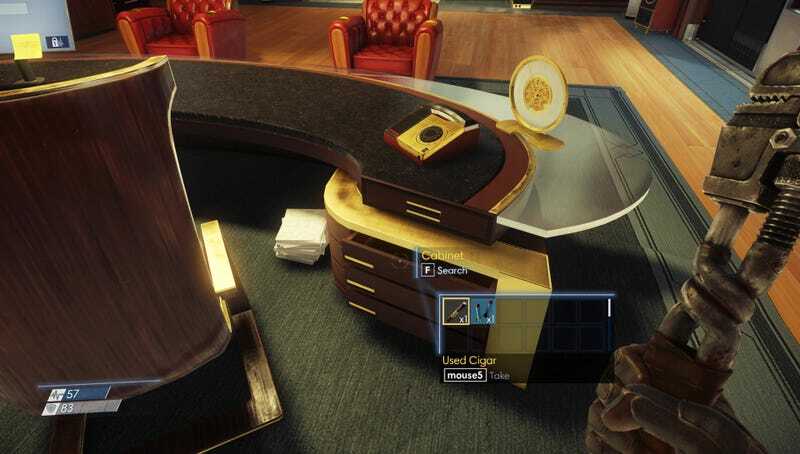 Similar to drawers and containers, you can interact with the computers in the game without leaving the “game space” and entering a “computer space.” The computers in Prey look similar to the computers in recent Deus Ex games, but because they’re so frictionless to use, they feel different. If you want, you can hit the Z button to lock your view to the computer screen, but I haven’t felt the need to do that yet. Just like when you’re done looking through a set of drawers, you can simply walk away from a computer when you’re done with it. Prey introduces a few of other machines that require complex interactions. Recyclers let you convert the junk you’ve picked up into useful fuel for Fabricators, which can 3D-print you ammo, health kits, and more. Both of those machines are also easy to deal with using a mouse and keyboard. Only the hacking minigame, which involves hurriedly driving a cursor through a hazardous collection of barriers and QTEs, feels like it would work better with a controller. I’m impressed with the quality of Prey’s PC version. Too few games manage to work this well on PC out of the gate, and a vanishingly small number of them work this well with a mouse and keyboard. This is how it should be done.